The premise is likable enough, but the humor is pretty lifeless and the storyline is incredibly predictable, both making this movie nothing memorable at all. Not a very good movie, the premise about a robber trying to escape a town, is fine enough, but the direction the movie takes him in is more annoying than fun. The robber gets stuck with the most bickering and frustrating couple since The War of the Roses. These two never stop arguing, and the robber is forced to basically spend the movie listening to them. This movie had potential, but boy did it screw that up. The Ref is not a very good or smart movie. It’s a film that has a simple, but enjoyable premise, but then takes that premise into the most predictable of directions. The humor isn’t very funny at all, and that really contributes to the lousy tone of the movie. Granted, Dennis Leary, who is a wonderful stand-up comic and natural comedic talent, is let loose and given the freedom to go off on rants here, but with this limited and constricting plot line, it just doesn’t work. The movie is about a robber named Gus, who holds a family hostage. 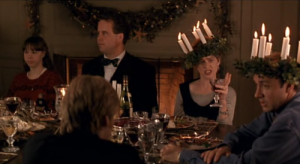 The family is composed of Lloyd (Kevin Spacey,) and Caroline, (Judy Davis.) There are other members who join them in the second half of the film, but for the most part it’s the two of them as a bickering couple dealing with Caroline’s affair and the possibility of getting a divorce. The first problem here is that there are no twists or surprises or even plot turns of any kind. Nothing new is revealed at any time during this movie. 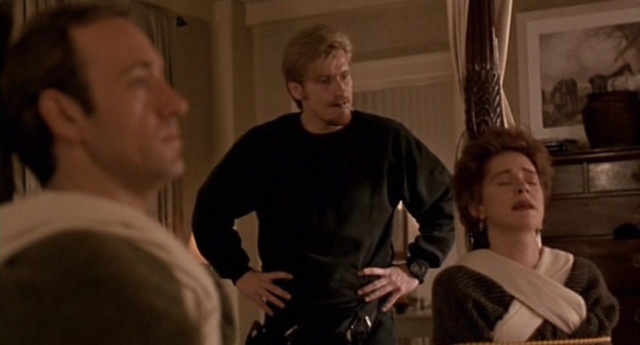 Considering that the film is basically one long therapy session between the members of this couple, with Gus caught in the middle, you would think that there might be some revelations and discoveries along that way. No such luck. Caroline’s affair comes out in the opening scene of the movie. The same goes for the blackmailing scheme their son, Jessie, is running on a man named Siskel, (JK Simmons.) Instead of leading up to this or making it a new angle in the plot, it is presented to us the very first time we meet the son. What a waste. The movie begins with Lloyd and Caroline in a therapy session with Doctor Wong, (B.D. Wong.) The therapist just listens and refuses to take sides despite the two members of the couple each appealing to him to do so. This is where we learn of Caroline’s affair and of her unhappiness with Lloyd. By the end of the session, the two of them are getting into a car together and heading for home. That’s when we meet Gus, robbing a mansion, and setting off a trap door and alarm system. When the alarm brings the cops his way, Gus ducks into a local store, looking for a way to escape. His idea is to kidnap a woman and have her let him stay in her home. The woman is Caroline, who is in the store by herself. Gus has no idea that her husband is in the car waiting, and she brings him over to the car, where he climbs in and decides this will have to do. Of course, it isn’t more than a minute later that Gus learns he has just kidnapped the most annoying bickering couple in the world. There is immediate arguing, once Gus gets in the car, about whether or not Gus would have kidnapped Caroline if Lloyd had been in there with her, and also over whether or not Lloyd intentionally missed a stop sign. Once they get home, Gus ties the two of them up with bungee chords, and starts to think of a plan. He’s got a partner named Murray who is still in town and looking for a way out. Gus contacts Murray and gives him the number of the house. His plan is to just wait it out here, with this family, until Murray has secured a vehicle to help them escape. Only there’s one little problem. The police are orchestrating a curfew, where everyone must be in their homes, and then they are conducting a door to door search to find the robber. So Gus goes into hiding at thefamies house. And that would be fine and easy, except that they are having people over. First, there’s Jessie, the son. Not only does he show up, but so does Siskel after him, to tell Jessie’s parents what their son has been up to. And then there’s Lloyd’s brother with his wife, children, and Lloyd’s mother. And here’s where the backstory and relationships start coming out. Lloyd and Caroline have taken loans from Lloyds mother for everything they’ve bought. This includes not only the house, but also a restaurant they once opened and failed miserably at running. And the mother charges them interest on everything. 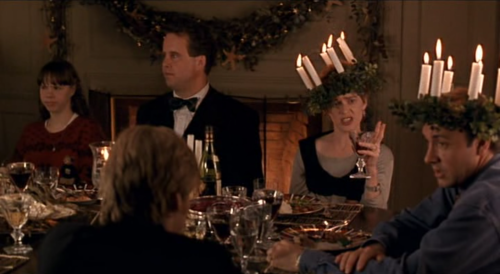 When the entire family is there, we get a ridiculous dinner with each character wearing candle headdresses, followed by a shouting match where everyone turns on everyone. You would expect some deep dark secrets to come out at this point, but no such luck. This movie has no reveals or tricks up its sleeve. There are lots of problems with the ref, including both the story and the characters. While the idea of a robber trapped in a small town that’s under curfew is pretty cool, the things that happen inside of the house with him are incredibly annoying. If there were some secrets here, left for the final act, (and I don’t mean characters finding out things they didn’t know about each other, but just things the audience didn’t know yet,) this could have worked. But this movie doesn’t have the sense to hold anything back or save anything for the end. It’s really just a very simple and predictable story starring some likeable actors before they made it big.